Tucker Carlson criticized CNN during his show on Wednesday night, arguing that the network was only defending free speech because it was “their speech.” CNN filed a lawsuit against the Trump administration earlier in the week claiming the White House had violated Jim Acosta’s first and fifth amendment rights. The entire fiasco began last Wednesday during President Donald Trump’s post-midterm election press conference. 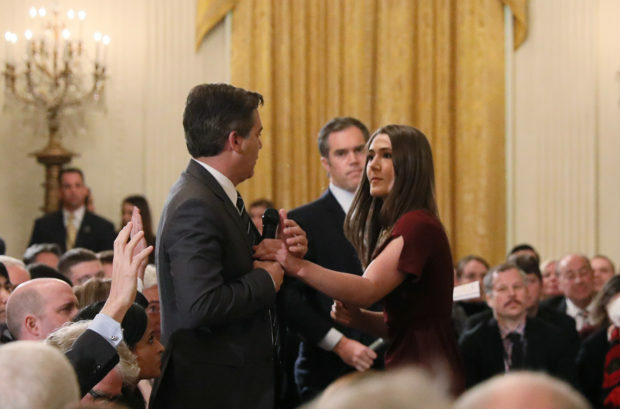 That night, White House press secretary Sarah Huckabee Sanders announced that Acosta’s press credentials would be revoked. CNN filed a lawsuit to get it back on Tuesday. “In the past couple of days, you have heard a lot of huffing and puffing about free speech and freedom of the press, and how those freedoms are currently imperiled by the White House. To be clear, we are for free speech, unfettered, absolute free speech. The kind of speech guaranteed by the First Amendment and ratified consistently by the Supreme Court,” Carlson began. “Take CNN, for example. It was a CNN that almost single-handedly led the campaign to have a broadcaster Alex Jones banished from the Internet, on the grounds that they didn’t like what Jones had to say. Ultimately, CNN succeeded in doing that. The network convinced every major tech platform to ban Jones and his outlet, InfoWars. You don’t have to like Alex Jones to see that as a terrifying loss for free speech, because it was exactly that,” Carlson stated.